You ready to start the LIVESTRONG.COM 30-Day Burpee Challenge? Good, because it’s week 1, and we’re starting off strong. We’re also starting off small. And that’s a good thing. You’re starting with one and adding two each day. That’s a grand total of 36 burpees for the week. Because we’re starting off slowly, you have the time to really perfect your form and you give your body time to adjust to the movement pattern (which is especially helpful for beginners). And what’s more, you can really set the tone for the rest of the month by getting yourself ready and utilizing the following tips. Establish your “why.” Why are you doing this challenge? To get stronger, be more active, push yourself a little more each day, find a support network? Your “why” will keep you going. 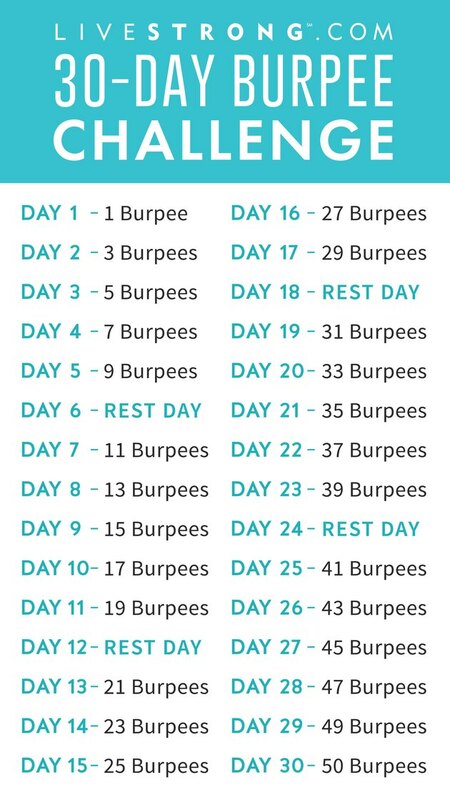 Print out your burpee challenge calendar (see below) or save a copy to your phone or computer. Keep the calendar where you’ll see it every day. Join the LIVESTRONG.COM Challenge Facebook Group and start engaging with the community there. Follow your challenge hosts — Mike Donavanik and Vanessa Villegas — on Instagram for additional workout motivation. Make sure you know what proper burpee form looks like. You only have one rep to do today! So slow it way down and focus on each part of the movement so you really master your form. Start by squatting down. Make sure your hips hinge back without arching your lower back or letting your knees go over your toes. Put your hands on the ground and jump or step back into a plank. You should be in a straight line from head to toe — shoulders over wrists, back flat, hips up. If you want, add a push-up here, keeping your shoulders over your hands, abs engaged and hips up. Jump or step your feet back to your hands and lift up slightly into a squat. Then reach your arms up overhead as you jump straight up. Land with your knees slightly bent to absorb the impact. That’s one rep! One of the great things about this challenge is that it’s for all fitness levels. If you’re a newbie, you can modify as described above. 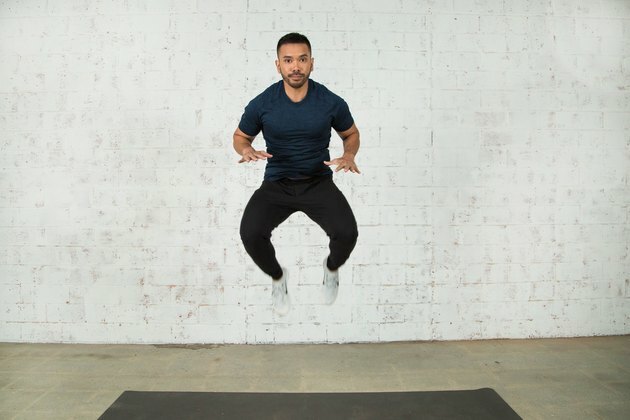 If you’re more advanced, you can incorporate some different burpee variations to make them harder. Think about each part of the burpee and how you can make it more challenging or more tailored to your goals. Even if you’re not at the advanced level yet, up the ante for yourself every once in a while and tell yourself that you’re going to use a few reps each day to do something a little bit harder. Remember: If it doesn’t challenge you, it doesn’t change you. In previous challenges (especially the squat challenge), our Facebook group members have shared all the fun and unexpected places they’ve completed their daily challenge — waiting for a meeting to start, office break room, while walking the dog, in the shower (careful you don’t slip!) and many others. You’re not alone in this challenge! Our Challenge Facebook group has more than 30,000 members just waiting to commiserate with how much you hate burpees and also to cheer you on as you tackle this challenge. If you’ve never posted in the group before, step out of your comfort zone and join the conversation today! Share your favorite burpee meme or motivational quote. Or if you’re feeling adventurous, post of photo or video of yourself doing your daily reps. You’ll be pleasantly surprised how supportive the community is. Day 6: Enjoy Your Rest Day! You may not feel like you need a rest day quite this soon, but any good fitness regimen has rest days programmed in. They give your mind and body a chance to rest, recover and get stronger. And if you’re feeling sore, today is a great day for a good, long stretch or foam rolling session. Because a burpee is a full-body exercise, pretty much any stretch you do is beneficial. Whatever feels sore is what you should stretch. You only get four rest days this month, so make the most of them. Take a hot bath (also great for muscle recovery), take a leisurely walk or hike and enjoy some beautiful scenery or do something low-key but still active that you enjoy — gardening, swimming, etc. Day 7 means 11 burpees, and things are starting to get tough! If you need to, it’s perfectly acceptable to break up your burpees into smaller sets. You can either opt to do smaller sets as part of one session or spread them throughout the day. Sitting too long at work? Burpee break! Suffered through a long, boring commute? Time for burpees. Feeling sluggish? Give your heart rate (and energy level) a boost with a few burpees. And be proud of yourself for finishing the first week of the burpee challenge! There's a lot more coming in week 2 and the following weeks. But take the momentum from this first week and carry it with you through the rest of the challenge. Remember you can always check in with the Facebook Challenge group if you need a little push. You got this!